Over the past few years, San Francisco’s jails have seen increased scrutiny by city officials and prison activists alike as their aging and unsafe structures have been brought to light. The two county jails located in the Hall of Justice building are currently the subject of a proposal to be replaced with new, seismically fit, and updated facilities. 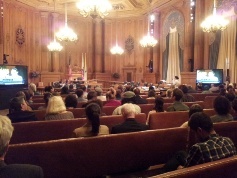 During yesterday’s three hour Neighborhood Services and Safety hearing at City Hall, supervisors heard from a multitude of officials and community members, all of whom deplored the current conditions of the jails. The hearing comes after the state rejected the city’s funding request of $80 million earlier this month. The proposed replacement jail project, spearheaded by Sheriff Ross Mirkarimi, is expected to include a total of 640 beds, 265 fewer than the 905 it will be replacing. The reduction itself could be seen by many to be a positive step in reforming the criminal justice system. Indeed, this number could shrink even more according to a Budget and Legislative Analyst report commissioned by Supervisor David Campos which suggested that, based on projected future inmate populations, a 384-bed jail would be adequate to house the city’s prisoners at half the cost. The report said the number of jail inmates has declined 30% since 2008, and is expected to continue to decline. San Francisco already has one of the nation’s most under-crowded jails at around 40-45% capacity, and the construction of a new jail remains debatable. The jail replacement project, part of the city’s Capital Plan, is expected to cost upwards of $600 million, and many have questioned its necessity when other alternatives to incarceration that have proved to reduce the overall jail population in the city remain underfunded. The demolition of the deteriorating jails must happen, but prison activists believe no new jail should be constructed. Instead, they suggest investing more in rehabilitation, mental health, substance abuse, and affordable housing programs, all of which help prevent incarceration in the first place. Dozens of members of Californians United for a Responsible Budget (CURB) and other activists crowded the hearing on Thursday showing an overwhelming agreement that the city should not build a new jail. Everyone at the hearing agreed with the fact that the jails need to be closed, but the question remains of where the prisoners in the city’s jails would go. There are currently six county jails, three in San Francisco and two in San Bruno (one sits empty). Should two jails in San Francisco close, the other jails could be able to absorb the rest of the prisoners, but the logistics would need to be worked out. County Jail 2 on 7th street currently acts as the women’s jail, and bussing prisoners to San Bruno would require additional costs in transportation to and from the jail to the courthouse. This would make it much more difficult for attorneys and especially families to travel forty-minutes out if they do not have a car. Sheriff Mirkarimi likened such a solution to kicking the can so that other counties could deal with the city’s jail population. “I really do not support the idea that if we out of sight, out of mind these populations to the south, to San Mateo County and San Bruno, that it is, I think, a logical fix,” he said. Activists suggest, however, that the additional burden placed is nothing compared to the violence of being incarcerated in the new jail that Mirkarimi is proposing to build, and the city could work on upgrading existing transit infrastructure with the money saved. About 75% of San Francisco’s jail population are pretrial, and many are in jail simply because they cannot afford to post bail. Public Defender Jeff Adachi spoke of the benefits of the pretrial diversion programs, which includes community service, that have had about 1,127 participants, keeping them out of the jail system. Along with suggesting expanding the pretrial diversion program, Adachi called for bail reform that could keep even more people out of San Francisco jails. These measures would be able to reduce jail population without the need to construct a new jail he said. Indeed, it seemed that everyone during the public comment was in agreement. One after the other, people spoke of the detriment that a new jail would have to the work they were doing to prevent prison entry. “We need to step back and look at not only how many can be diverted after arrest, but we can prevent people from being arrested in the first place,” said Jennifer Friedenbach, executive director of the Coalition on Homelessness. Dorsey Nunn of the Legal Services for Prisoners with Children challenged Mirkarimi to not be on the “wrong side of history,” reminding him that while the city’s population of African Americans is just 7%, they make up over half of San Francisco’s jail population. Other called for greater attention to the city’s housing crisis, noting that about 23% of prisoners are homeless. The Board of Supervisors will have four more opportunities to vote on the proposed jail replacement over the next two years, and activists believe they are making progress. Just six months ago, the conversations at City Hall were much different, with officials now more open the idea of closing the jails without a replacement being a real possibility. The overwhelming opposition to the new jail will no doubt gain steam as groups like CURB continue to mobilize around the state.